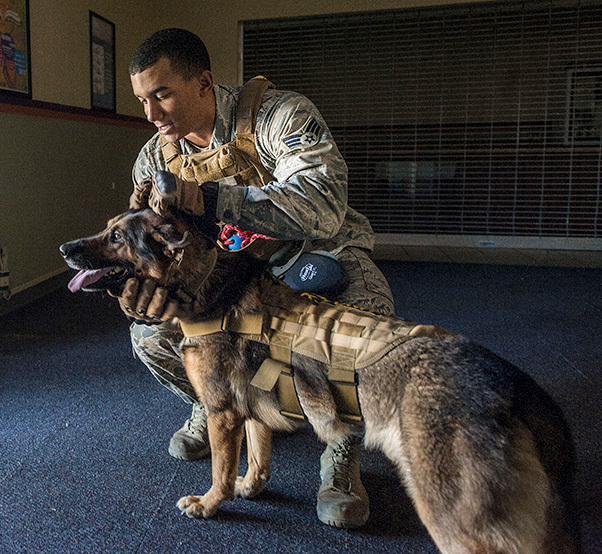 Senior Airman Dante Tost, 355th Security Forces Squadron military working dog handler, poses for a photograph with his MWD, Darius, at Davis-Monthan Air Force Base, Ariz., Jan. 4, 2018. Tost, having recently trained into becoming a MWD handler, completes exercises with Darius in order to create a stronger bond between the two partners. MWDs are specially trained to detect either narcotics or explosives, and go through simulated training exercises in order to hone their skills. Darius was specifically trained as an explosives detection MWD. Dante and Darius conducted the bomb sweep exercise in order to ramp up their skills for an upcoming deployment. 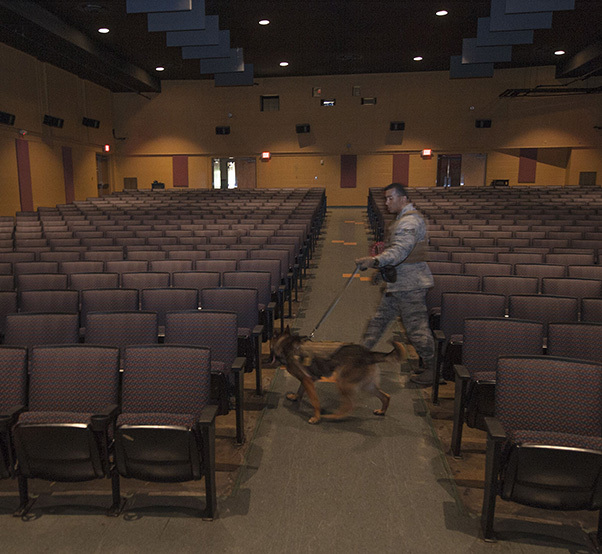 Senior Airman Dante Tost, 355th Security Forces Squadron military working dog handler, guides his MWD, Darius, through the base theater during a bomb sweep exercise at Davis-Monthan Air Force Base, Ariz., Jan. 4, 2018. Darius is trained to detect potential explosives in diverse environments. 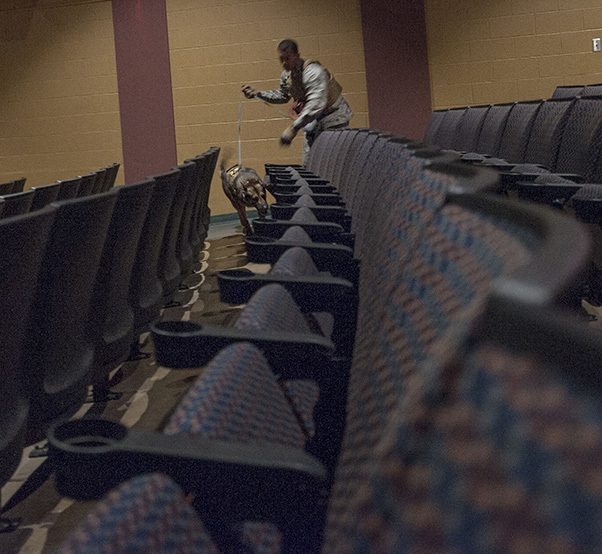 Senior Airman Dante Tost, 355th Security Forces Squadron military working dog handler, guides his MWD, Darius, through the base theater during a bomb sweep exercise at Davis-Monthan Air Force Base, Ariz., Jan. 4, 2018. Darius was specifically trained for explosive detection. 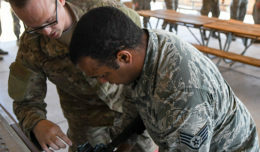 Senior Airman Dante Tost, 355th Security Forces Squadron military working dog handler, receives feedback after completing a bomb sweep exercise at Davis-Monthan Air Force Base, Ariz., Jan. 4, 2018. 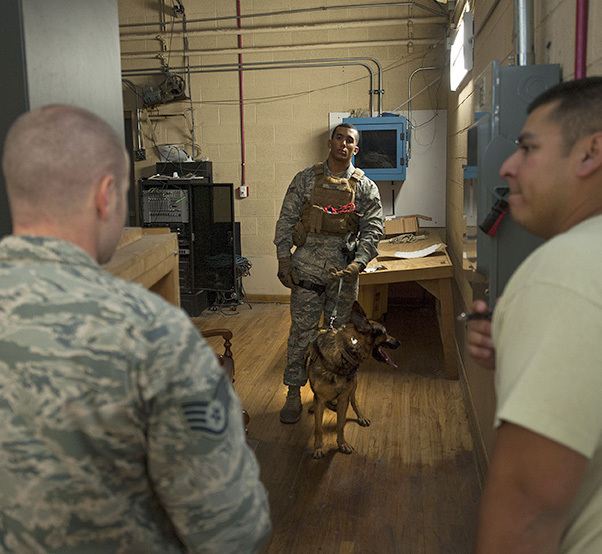 Tost and his MWD Darius conducted bomb sweep training to prepare for an upcoming deployment. 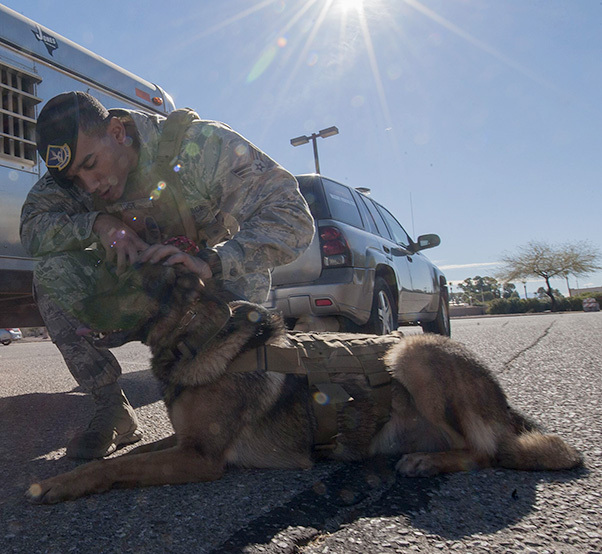 Senior Airman Dante Tost, 355th Security Forces Squadron military working dog handler, praises his MWD, Darius, after he successfully detected a simulated explosive during a training exercise at Davis-Monthan Air Force Base, Ariz., Jan. 4, 2018. 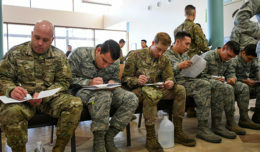 Tost and Darius participated in the bomb sweep exercise in order to strengthen their bond during a deployment the two are scheduled to take.